About 12,000 independent shops and nearly 7,000 branches of major chains have closed so far this year in England and Wales, according to research. The Local Data Company (LDC) says the average retail vacancy rate has risen from 4% a year ago to almost 12% now. Margate in Kent is the worst hit town, with a rate of 25%. Cities in the north of England like Leeds and Liverpool also have rates of more than 20%. 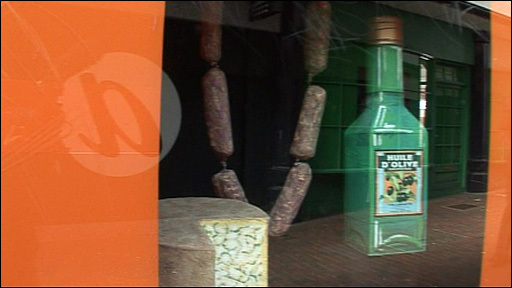 LDC said empty shops had "a corrosive effect upon the confidence of an area". The collapse of Woolworths has had a major impact on high streets, LDC said, with about 70% of its 800-plus shops still lying empty. A model of a cup cake made out of used newspapers may not seem like the most obvious way to fight the recession, but for Margate at least it's a start. One of the town's shopping arcades has been transformed with local artists commissioned to come up with paintings and sculptures for the windows of vacant premises. "We've had a very positive reaction from the public," says Heather Sawney, who developed the displays for Thanet District Council. "Having the art in the windows is no substitute for having new tenants for the shops, but at least it's a start." The research suggests that northern England and the Midlands have generally fared worst. At 22%, Derby has the highest retail vacancy rate of any major urban centre, with Wolverhampton close behind. The south of England generally fared better, with only Croydon and Exeter featuring among the 10 worst town centres with vacancy rates of 15.4% and 14.9% respectively. In central London, 12.8% of shops are empty. Nottingham was one of the best performers, with a rate of just 2.5%. "Just as thriving town centres demonstrate vitality, empty shops lay bare weakness and failure," LDC said. "Empty shops have a corrosive effect upon the confidence of any area - and their numbers are growing. "The damage is spread across the country and affects all levels of the retail hierarchy from the largest regional centre to the smallest high street." The study said there had been a 50% drop in new store openings in the past 18 months and in some areas, a marked increase "churn" - where a shop is opened and closed repeatedly under new guises. The highest churn rate, more than 700%, was found in Wakefield, West Yorkshire, with the next worst - Wolverhampton - seeing a rise of 387%. "In a recession, churn tends to be driven more by a failure to trade and this time around has not been an exception," LDC said. The research firm did say there were some signs of recovery, with official figures showing an increase in sales volumes of 2.9% in June compared to the previous year. This was "way above expectations and could set the scene for a stronger than expected second half of the year," it said. "However, this has to be balanced against continued rises in unemployment and therefore less spending power overall." 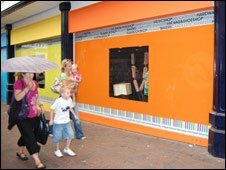 In some towns, including Margate, councils have offered vacant premises to local artists to display their work and try to improve the appearance of the high street. A spokeswoman for Communities and Local Government stressed that a lot was being done to help those struggling on the high street. All unoccupied properties are exempt from empty property rates for the first three months and 70% of all properties won't pay any empty rates if they fall empty, she said. What to do with empty shops?